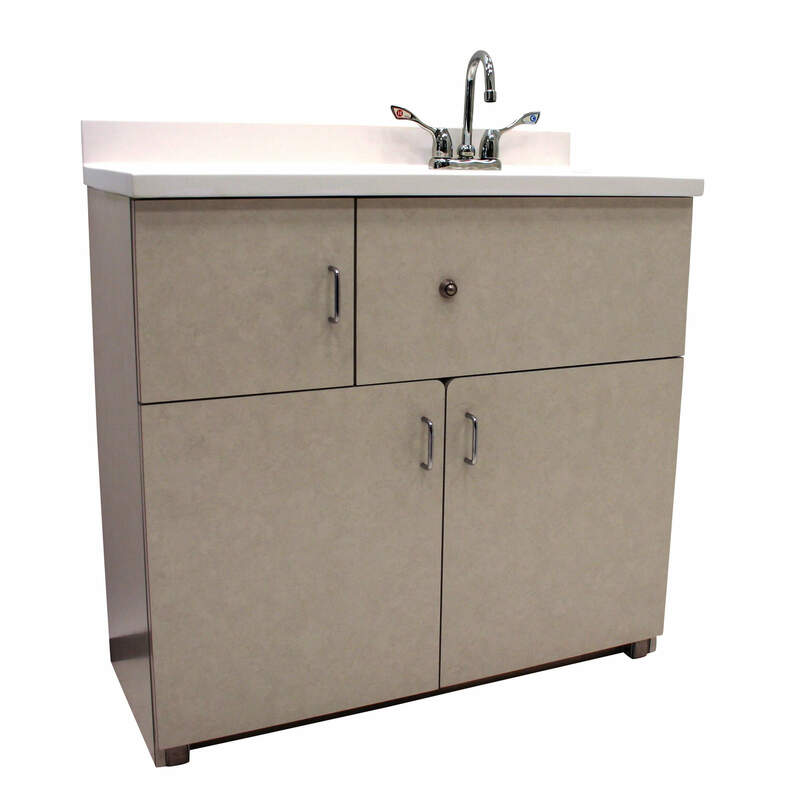 38" wide cabinet, pivoting (hidden) stainless steel toilet, hydraulic flush valve with pushbutton, stainless steel rectangular drop-in lavy, deck mounted centerset faucet with wrist blade handles and 10" rigid gooseneck spout, laminated countertop and cabinet. This unit is free-standing and configured with a back wall waste connection. This option provides a hand held, hand activated sprayer used to rinse out bedpans. The location varies per unit specified. 38" wide cabinet, pivoting (hidden) stainless steel toilet, hydraulic flush valve with pushbutton, stainless steel rectangular drop-in lavy, deck mounted centerset faucet with wrist blade handles and 10" rigid gooseneck spout, laminated countertop and cabinet. This unit is free-standing and configured with a side wall waste connection. 38" wide cabinet, pivoting (hidden) stainless steel toilet, hydraulic flush valve with pushbutton, stainless steel rectangular drop-in lavy, deck mounted centerset faucet with wrist blade handles and 10" rigid gooseneck spout, laminated countertop and cabinet. This unit is free-standing and configured with a floor waste connection.